Comment: At the end of the book of Job, it tells us that “the Lord gave Job twice as much as he had before”. Job has suffered and been down to nothing for a long time, so this double restoration must have been overwhelming! After his ordeal, and the Lord’s sharp response to him and his friends, Job must have been very surprised to receive anything, much less twice as much as he had before. In Wanda’s Roses, Wanda finds a trash-covered, abandoned lot, with nothing growing in it. She believes that a scraggly thorn bush in the lot is really a rose bush and hopes it will bloom. But the neighbors know it is not a rose bush; they know that it is just a thorn bush in a dirty, abandoned lot. But they hate to see Wanda disappointed, so when she invites them to a party in her now cleaned lot, they all bring roses,so that she can really have a rose garden and the smell of roses fills the lot. Wanda starts with nothing, but ends up with so much more than she could imagine. We may not understand Job’s suffering or the Lord’s sharp response to him, but we can imagine the joy of receiving much more than expected after such an ordeal. We hope and pray that the Lord will respond to each of us with a double portion of blessing. Comment: To intercede for someone means to work on their behalf, to look out for them, support them, to protect them and do things which benefit them. Our passage from Hebrews tells us that Jesus always lives to make intercession for those who approach God through him. 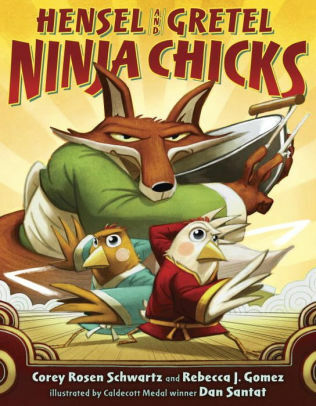 In Hensel and Gretel: Ninja Chicks, Hensel and Gretel’s father is kidnapped by a fox, and trained as they are to be ninjas, they rush out to their father’s aid and use their skills to defend, help and rescue him. Hensel and Gretel are committed to help and rescue their father; that is, they are committed to interceding for him, just like Jesus intercedes. That intercession may take different forms, but the intent is the same. And because Jesus is our high priest even today, he still lives to intercede for us, working on our behalf, looking out for us, helping and protecting us. Comment: In The Lion and the Bird, a lion takes care of a wounded bird found in his garden until the bird is well enough to fly again. Normally a lion wouldn’t react this way to a bird, but this lion shows mercy. In our scripture passage, Bartimaeus asks Jesus to have mercy on him, and Jesus does. Jesus cares for him, he calls him over, asks him what he would like, and grants him his sight. Bartimaeus then follows Jesus as a disciple, and in today’s story, the bird continues to return after the winter season to visit the Lion who cared for him. The times we are shown mercy and the chances we have to show mercy to others are opportunities for relationships. By caring for others and being cared for, we foster our connection with other people. Lectionary Links (RCL): October 28, 2018 by Storypath is licensed under a Creative Commons Attribution-NonCommercial 4.0 International License.